Monday morning we shuttled our car to Presque Isle campground – the finish line of the trip at the park's western end – then stopped at the park HQ to pick up keys for each of the cabins we would be using over the next six days. The park ranger on duty was surprised to find so many keys reserved for us. It is apparently not very common to hike cabin-to-cabin over so many days. He then gave me a heap of park information to take along, including a flyer about black bears. A bear had been sighted frequently along one of the trails we would be hiking, and he advised extra caution. 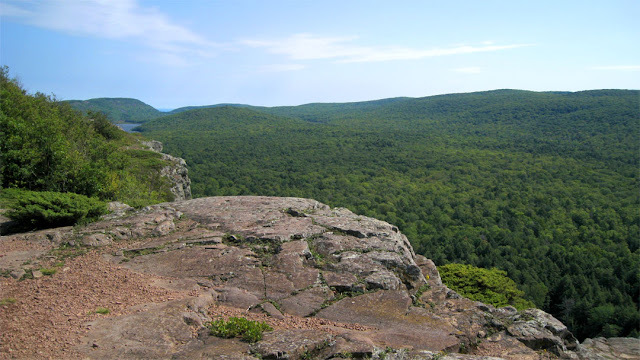 The hike would begin at Lake of the Clouds overlook, the most popular destination in the park. Our shuttle driver pulled away after leaving us alone in the parking lot, and we experienced that exciting moment of realization of what we were about to do. We now had no means of communication (our phones lost their signals as soon as we left the resort that morning), and six days of hiking stood between us and our car. We started up the path to the overlook to find the trailhead and leave the tourist scene behind. It was 11:30 a.m., sunny, breezy, and felt like low to mid 60's: perfect hiking weather. Another view from the escarpment. Lake of the Clouds is in the distance. After snapping a few photos at the overlook (including a shot of an interpretive sign that some insane creationist had defaced by scratching off each reference to the length of time it took for the landscape to form), we struck out on Big Carp River Trail. 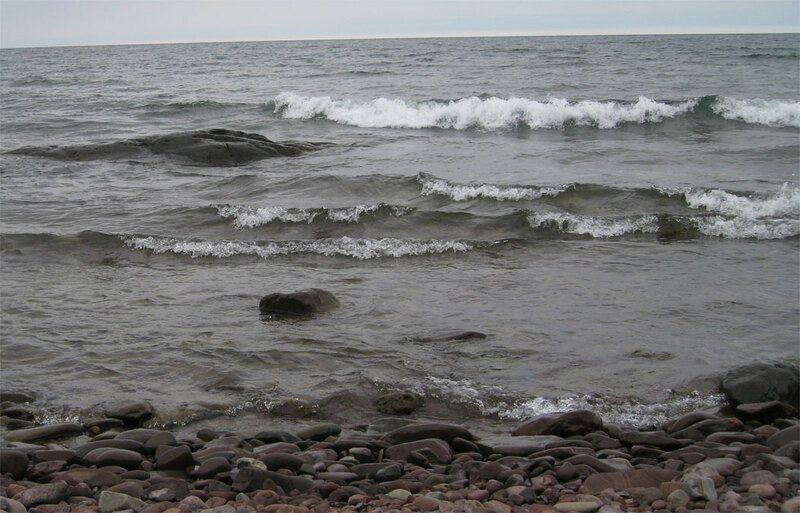 At 9.6 miles, BCRT follows its namesake river from Lake of the Clouds to its mouth on Lake Superior. Geology - it's amazing what can happen overnight! 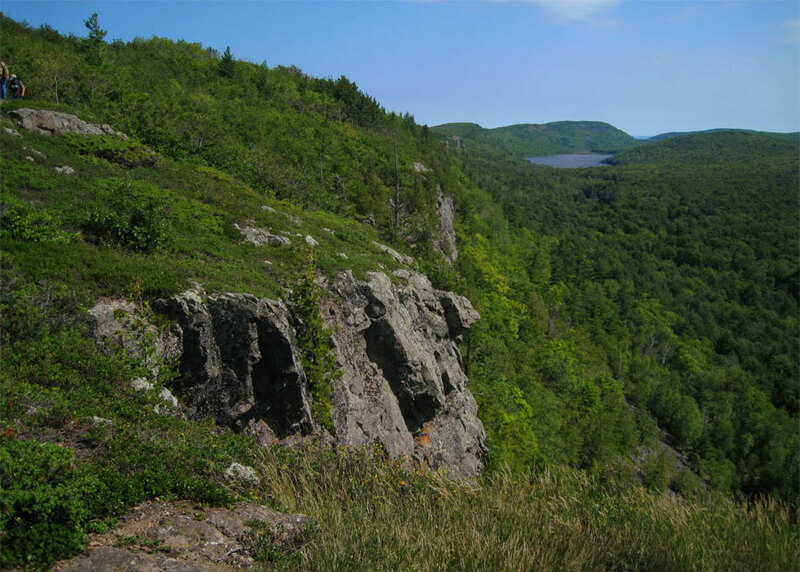 High above the river valley, BCRT starts out along the escarpment that is a geologic highlight of the park. The escarpment was formed by ancient lava flows. A tilted layer of basalt sits on top of a layer of sandstone, and as the sandstone erodes away, chunks of rock fall down the cliff's face and pile up as talus. 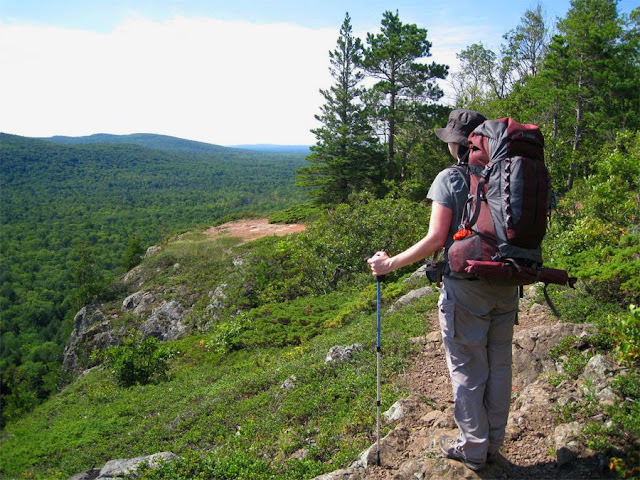 The trail begins by following the edge of this steep ridge and offers view after view of mountaintops, endless forest, and the river valley below. If we would have been able to push our trip back a month, the fall color in October would have been stunning. 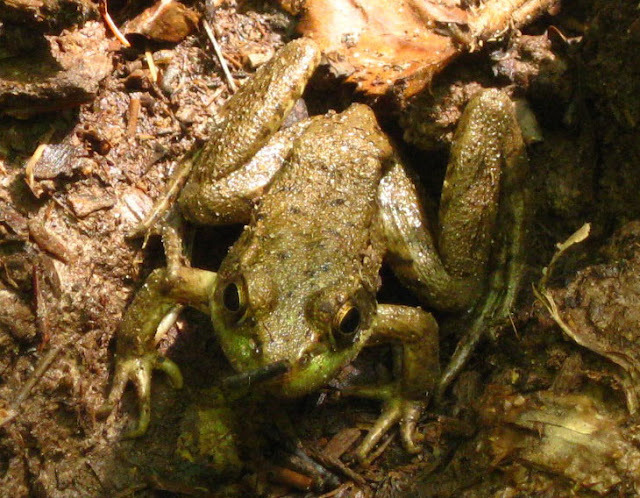 About two miles from the trailhead, the trail descends into the forest. Here the shaded understory cools the air, and sunlight filtering through the forest canopy creates a wonderful green glow above. Car-sized boulders sit along the trail, and enormous hemlocks and pines, many hundreds of years old, tower overhead. For the next four or five miles, BCRT has a few steep climbs and descents as it follows the river valley. 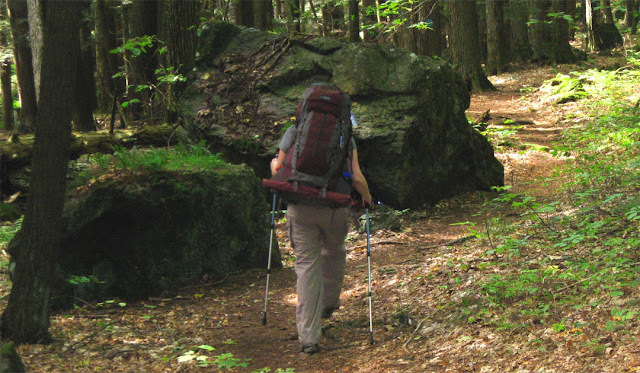 We passed a handful of very nice, spacious backcountry campsites along the trail. For our lunch break, we rested on a fallen tree and made peanut butter and jelly tortillas. We started eating this meal on our first backpacking trip, and it has remained our favorite trail food. 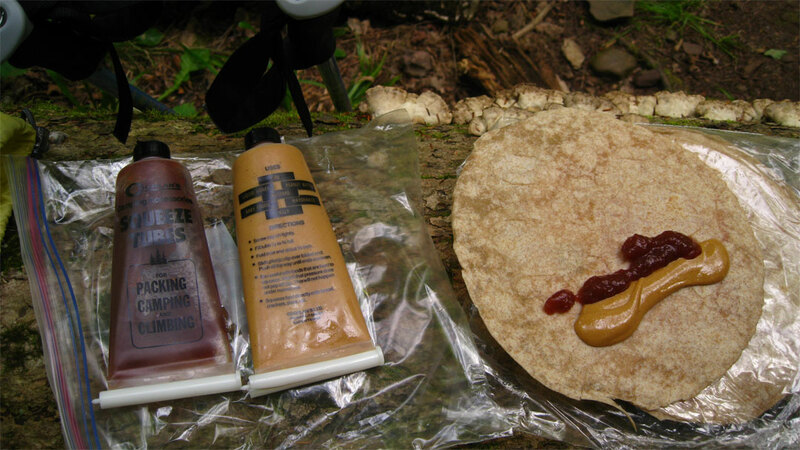 The materials are very easy to pack, there is no mess to clean up, and peanut butter and jelly always tastes great after a few hours of hiking. Shortly after lunch, we finally reached the river and came to the first of the day's two river crossings. A footbridge guided us over the first one; the second one came a mile and a half later and was a bit more interesting. Here the river had to be forded, but it was only about ankle-deep. Not wanting to push our luck with the waterproofing of our boots, we slowly made our way across, stepping from one slippery rock to the next. We passed a few more impressive backcountry sites, the best of which was at Shining Cloud Falls. At this point, the trail follows a steep ravine, where a series of 2 cascades can be heard rushing down the valley. The campsite in this spot is near the river and within earshot of the falls. This would be a terrific place to spend the night, and if we hadn't made plans to stay elsewhere, we would have happily pitched our tent. Unfortunately, we were so tired at this point that the steep and slippery descent to the water in order to get a better look was not appealing. Continuing on, a few more small unnamed waterfalls provided points of interest along the remainder of the trail. We reached the mouth of Big Carp River around 5:30 p.m. Our cabin, Big Carp River 4-bunk, was located upstream, away from the lake. Because it was tucked back in the woods, not much light penetrated the windows, and it was fairly dark inside. The river bubbled past the side of the cabin, and a short walk from the front door led to Lake Superior's rocky shore. In the cabin log book, the previous guest left a note to “enjoy climbing Kilimanjaro” to go to the bathroom. He or she was not exaggerating much; the outhouse was located at the top of an extremely steep and intimidating hill. I had managed to develop a blister on my left big toe, which added a thrilling element of pain to the nearly vertical climb. The previous guests had left a little firewood inside the cabin. We collected a bit more, but nearly all of it was damp, and we had some difficulty getting a fire going in the wood burning stove. We settled for a very small fire and made use of a few candles that had been left behind. Dinner was made and eaten quickly, and we went to bed soon after. The thin mattresses on the bunk beds were rock hard, which made us feel a little less like sellouts for not tent camping on this trip. High winds, rain and thunder woke me up frequently throughout the night, and I wondered what tomorrow would bring. So wonderful to finally see and read about your latest trek. I've been going to Lake of the Clouds since I was a kid in the '50's, and 20 years ago scattered my late wife's ashes there as she asked. 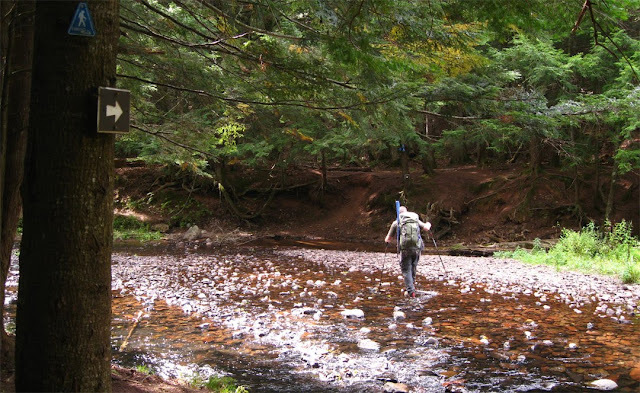 My sons and I spent a weekend at one of the trail's cabins there in 2000, and hope to again. Thank you, Richard. LOC is definitely beautiful. Later in the trip, we swing by it again and are able to see it from a nicer vantage point. Maybe next time I'll get to stay in the cabin that's right on the lake, or in one of the campsites that overlooks it. Very cool! Sarah and I have considered doing something like this, so I'm reading with great interest... especially about the cabins! A word to the wise on that cabin by the lake: the only potable water nearby is a row across the lake (a small rowboat comes with the cabin) and then a trek uphill to a small cistern halfway up the hill. Fill up in the daylight, as you'd never find the trail (let alone the cistern) in the dark! I was wondering about where you parked your car. Now I see. If you did it again would you stay in the cabins or tent it? I am planning a trip for Sept. At this point I don't know what is available, I might not have a choice. ;) We didn't mind the cabins on Isle Royale, especially the night it stormed. 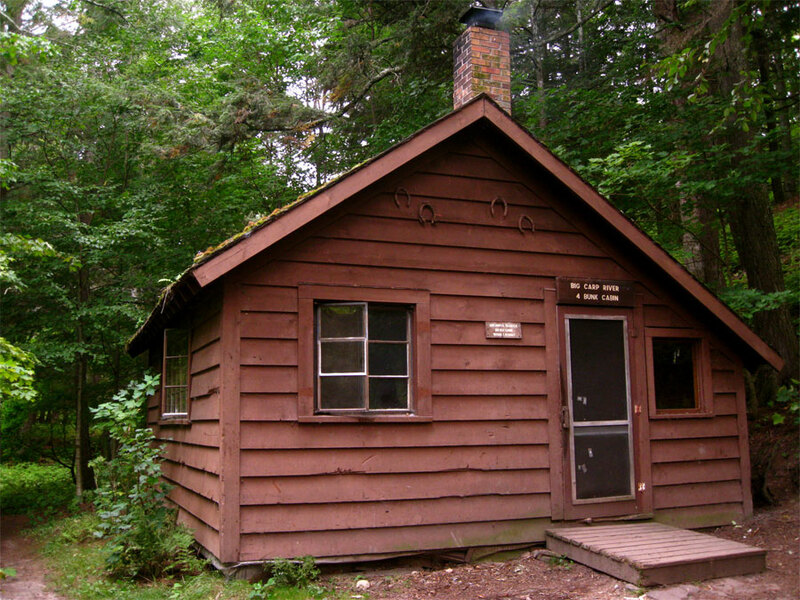 The cabins are cool and I'm glad we had that experience, but if we did it again, we would use our tent. We passed many great tent sites that made us miss our tent. You probably know this from your planning, but the cabins at the Porkies are real cabins (not like the 3-sided shelters on Isle Royale). They have wood-burning stoves and (extremely hard) bunk beds. 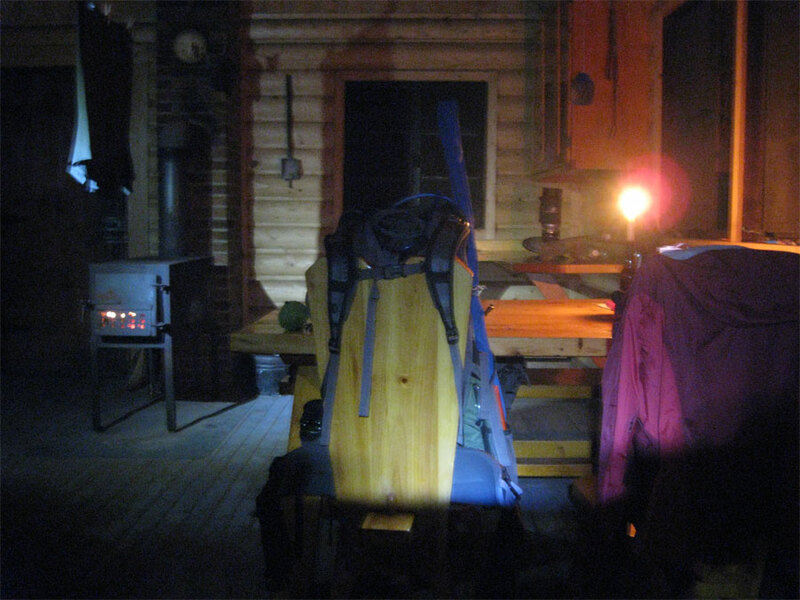 It was really nice to be able to heat up the cabins on the days we were caught in the rain or had cold weather. If you've missed your chance for cabins, I wouldn't worry. The tent sites looked great! I can't wait to hear about your trip - I hope you write about it. Are the wood burning stoves for cooking on? What other items are for use in the cabins for cooking?? DJ-you can probably use the wood-burning stoves for cooking, but I've never done it so I don't know how easy/quick it is compared to using a camp stove. The cabins have various cooking items in the cabinets, but it can be hit or miss, so you should bring some cookware with you. It's been a few years since I've been to these cabins, so it might be a good idea to contact the park regarding how well they're currently stocked. Hope you have a good trip!